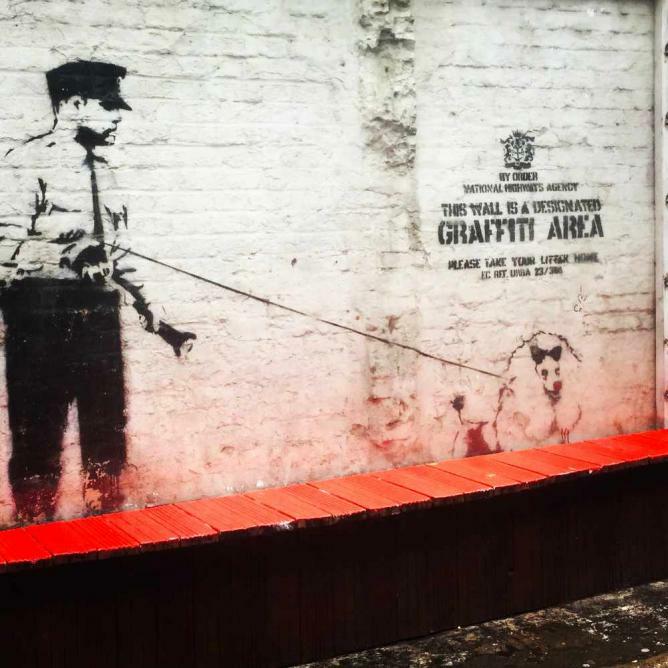 Located in the yard of the Cargo Club is a satirical masterpiece from none other than Banksy. Adjacent to this image stands another from the artist; in fact the whole street is bursting with visual pleasures. Shoreditch may very well be the Street Art Capital of London. Great Eastern Street is home to two graffiti covered tube trains perched on containers on top of a building, captioned: ‘Lets Adore And Endure Each Other.’ You can also find a lovely tribute to the late actor Bob Hoskins, this piece refers to his lead in 1986 neo-noir film Mona Lisa. A 300-metre tunnel underneath Waterloo Station, this place is completely and utterly covered in street art. 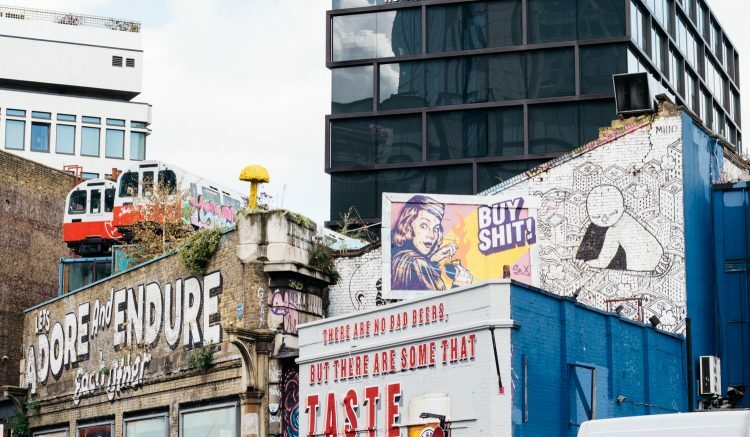 It was made famous by Banksy seven years ago when he held a Festival of Cans there and since then it’s become a legal place to spray – street art, stencil, graffiti; you’ll find all different styles under the one roof. A lot of people go there to practice so it’s almost guaranteed that you will see people spraying there. And you won’t see the same art there from one day to the next. It changes that quickly. Literally, someone will be spraying in the morning and someone will be spraying over it in the evening. We can’t forget Camden. There used to be a lot if street art there, but as the area gets redeveloped a lot of it is going. So be quick! I suggest starting from Mornington Crescent and head up Camden Road. Walk along the left hand side until you get to the Beatrice pub – there’s an alleyway there that is stunning, with about 10 big pieces all told. Came back out to Camden Road and carry on walking towards Camden Markets. On Camden Road, head over the lock and past teh Stables until you come to Hawley Street on the right. Go into Hawley Mews, there’s a lot of very good artists on that wall there. Hartland Road nearby has a stunning Dan Kitchener, the Tokyo rainy night scene, that is really impressive. It’s one of those pieces that you’ve just got to stand back and just take it all in. Trust Icon, Amara poor Dios, Gnasher Murals, Irony, Cranio, Señor X, Vanesa Longchamp, Nomad Clan, Captain Kris, all have stuff around here. If you carry on up towards Chalk Farm, just on the left, you’ll find a huge Kobra mural which is super impressive. Head straight across Bethnal Green Road to Chance Street and you’ll find two unmissable pieces of artwork. 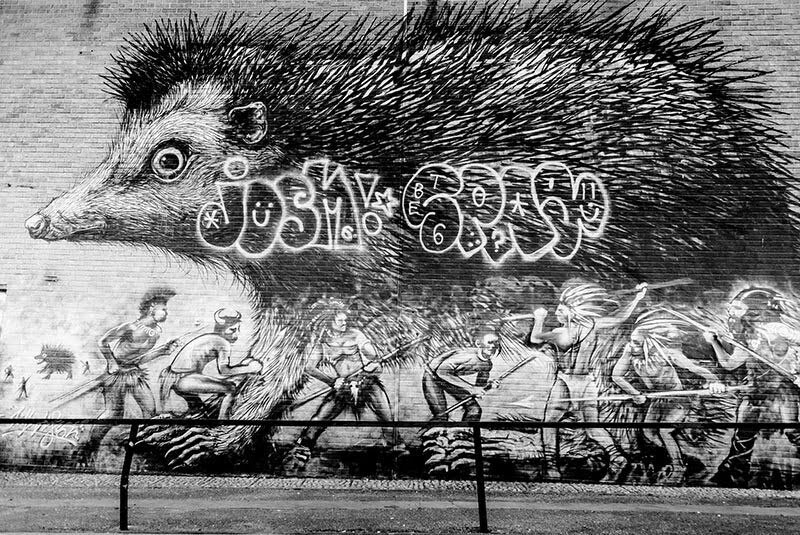 The first is a huge hedgehog by Belgian street artist ROA, who is known for his large sketch-like urban animals. As is the case with street art, the original masterpiece has been ‘developed’ with a few tags and a gang of native Americans appearing to hunt the hedgehog.